Taman Wawasan may not be as not as well known as some of the other Putrajaya parks such as Taman Wetlands or the Putrajaya Botanical Gardens but it is certainly worth spending some time there. 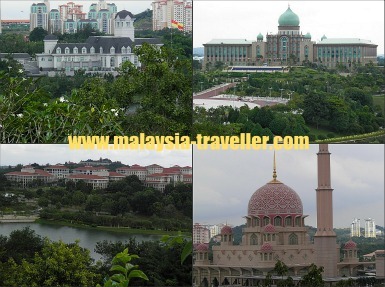 It is located next to the lake in the heart of Putrajaya and from its many viewing platforms you can a get a great vantage point to see the city's main sights such as Dataran Putra, the Putra Mosque, the Prime Minister's Office and the Sultan of Selangor's palace (Istana Darul Ehsan). The park covers 137 acres. On the top of the hill in the middle of the park is Wisma Putra (The Ministry of Foreign Affairs) which is obviously not open to the public but it is a photogenic building and its clock tower sounds off various chimes and music every hour. 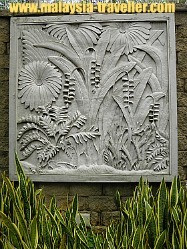 - A long pond full of colourful lotus plants and buzzing with dragonflies. - A pebble beach, complete with coconut palms on the bank of the river. The water may not be inviting enough to swim in (large monitor lizards inhabit these waters) but the beach has a relaxing ambience. - A hibiscus garden (Laman Bunga Raya) showcasing Malaysia's national flower. - An amphitheatre in case you want to show off your acting skills. I suspect this facility is rarely used. - A jungle walk/jogging path with good views. There are plenty of gazebos for picnics and relaxing. I don't think there is any children's playground here so some kids might find it a bit boring but there is lots of space to run around. It is a great park for cycling but the paths are hilly so you need gears (or strong leg muscles!). To see more photos take a look at my blog. Open daily from 7am to 7pm. The entrance to the park is on Lebuh Bestari. Drive up to the Wisma Putra building at the top of the hill and you will find a free car park. If you go at the weekend yours will probably be the only car there. Plenty of buses go to Wisma Putra from the Alamanda shopping mall and/or Putrajaya Sentral train station (Nos. 102, 200, 301, 401, 501, 600, 701, 800). You can check the Putrajaya Municipality website for bus timetables and routes.